A mysterious masked killer, who phones his victims before attacking them, decimates the local teen community. Scream might well be the most widely seen horror movie ever. Well, why not? It is a really good one after all! The movie is a basic slasher with a typical “guess who the killer is?” scenario. But it has a little extra twist in that it plays around with the basic rules of horror movies in a very inventive way (never say: I’ll be right back!). The way the killer teases his victims before killing them is also pretty well-thought, and manages to create a very stressful atmosphere. The all movie is actually pretty scary, with lots of tension and jumpy moments. The finish (careful spoilers!) … with the teens being influenced by horror movies is a bit far-etched but clever nevertheless. It leaves the viewer with a feeling that such situation may actually happen, and makes you feel pretty insecure for long after the movie is finished. 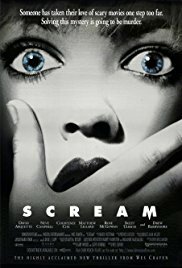 Scream is the film that finished to settle Wes Craven (A Nightmare on Elm Street, Hills Have Eyes) as one of the greatest horror masters.